Miramichi ~ The River is Just the Beginning! The City of Miramichi (Meer-a-mish-SHEE) was born on January 1, 1995, the resulting amalgamation of two towns, three villages and several local service districts perched along the last easterly banks of the Miramichi River, in northeast New Brunswick. Miramichi is not just the name of our city, however. It is a river, a community, a region, an attitude, an identity, a culture. To its people, “The Miramichi” is home sweet home. Miramichiers are known far and wide for their hospitality, especially at home. Whether you are a native Miramichier or you’ve arrived on The River from away, it’s not long before you see the friendly grins and hear the familiar “How’s she goin’?, followed by the only understandable reply: “The Very Best! An overview for your visit to the Miramichi! 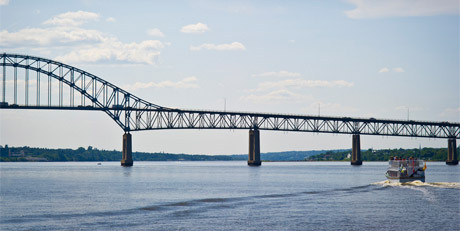 The City of Miramichi is located on the northeast coast of New Brunswick, Canada’s Picture Province. Fredericton is 2 hours south, Moncton is 1 hour 30 minutes South east, Bathurst is 40 minutes north, while Miramichi Bay is only 30 minutes. The Miramichi River, world-famous for its salmon fishing runs right through the city to the mouth of Miramichi Bay and into the Gulf of St. Lawrence. Miramichi is well-served by print, electronic media and a highly advanced fiber optic telecommunication system. Residents enjoy easy access to high speed internet service, cable and satellite television services, daily provincial and national newspapers, a thrice-weekly community newspaper, three local FM radio stations, a local French language radio station, and CBC radio in both official languages. Miramichi Transit, runs around the river six days a week and will get you wherever you need to go, often in less time than it takes to drive. The travels through Retirement Miramichi 22 times each day. Cabs are not metered and fare to the major shopping district is $6 (approx) one way. Rail – Miramichi is on the VIA Rail route connecting Halifax, NS, to Montreal, QC. Bus – A bus service to cities connects within the province and beyond. The local depot is located at the VIA Rail station in the west of Miramichi. Miramichi enjoys a cool, moist climate with a mean annual temperature of 4.7 °C (40.5 °F). The January mean temperature is −10.7 °C (12.7 °F) and the mean July temperature is 19.2 °C (66.6 °F). Our proximity to the Gulf of St. Lawrence tends to moderate the winter climate, but the Arctic air sometimes penetrates into the area during winter. Miramichi winters are sunnier than almost anywhere else in Canada, averaging 120 hours of bright sunshine in January. Summers are warm, sunny and long bouts of high humidity are not usual. The region averages 250.5 hours of bright sunshine in July. Miramichi’s cultural identity is celebrated year-round with events such as the Rotary Spring Fest, Canada’s Irish Festival on the Miramichi, Acadian Day, the Miramichi Folk Song Festival, Miramichi Celebration of Scots, First Nations Pow-Wows, agricultural shows, multicultural festivals, and Fiddlers’ Weekend. Traditional dance, music, food and humour provide a colorful background to local festivals and cultural events. View festivals & attractions. From clean, simple motels to four star hotels with spectacular views of the river, Miramichi has a variety of options for travelers at any price point. All of our hotels are near downtown areas, meaning you’ll spend less time driving around, and more time enjoying everything that there is to see and do. Whether it’s a rustic weekend away from the city or a week-long adventure consisting of fishing, hunting and getting back in touch with nature, the numerous camps and cottages along the shores of the Miramichi will provide you with all you need for your wilderness retreat. For a true taste of Miramichi hospitality, come stay the night at one of our beautiful bed and breakfasts. With welcoming hosts and well-appointed rooms, you’ll feel right at home during your visit. View accommodations. Atlantic salmon, fresh lobster and other traditional Miramichi meals fill the menus of our many restaurants. Classic dining rooms on the river, patios and quaint cafés and diners all make up the unique food culture of the Miramichi. Come taste for yourself thee diverse and delicious options the Miramichi has to offer! View restaurants. Major retail and service providers operate within the three shopping and service districts around the city. From furniture to furniture repair, major grocery chains to specialty bake shops, and the second-largest Walmart in New Brunswick, Miramichi is well served and serviced. Major department stores and dollar stores, five major banks, a full-service credit union, shoe retailers and shoe repairs – it’s all here in Miramichi. There are two year-round Farmers Markets, one on Fridays and one on Saturdays, offering a wide variety of locally produced crafts, baked goods, ethnic foods and much more. The Harmonized Sales Tax (HST) is 13 per cent and is applied as a single rate to the same base of goods and services as the GST. View shopping & services. Health and wellness in the Miramichi region is administered by the Horizon Health Network, one of two health districts in New Brunswick. The Miramichi Regional Hospital is a six-level, state-of-the-art facility located in the center of the city. The hospital sits across the road from the banks of the Miramichi River and the grounds provide walking trails for staff and patients alike. The primary public health insurance in New Brunswick is NB Medicare. Prescription drug coverage is available under the NB Prescription Drug Program and is based on income. In addition to a 24-hour emergency department, the Miramichi region is serviced by after-hours clinics in both Miramichi East (Chatham) and Miramichi West (Newcastle), for prescription services and other minor medical issues.